DUESSELDORF Germany (Reuters) - A storm raged over Germany's most populous state late on Monday, causing at least one death, forcing Duesseldorf airport to shut down temporarily, disrupting public transport and making some roads impassable due to fallen trees. A cyclist aged around 50 died in Cologne after being hit by a falling tree that local police said was probably struck by lightning. Thunderstorms, strong winds and heavy rain hit the western state of North-Rhine Westphalia, causing Germany's third-largest airport to close for around an hour. Ten incoming flights were diverted while 10 other flights were cancelled. The airport said gusts of up to 150 kilometres an hour (93 mph) were recorded. It opened again at 10 p.m. local time (2000 GMT/9.00 p.m. BST). Train services were temporarily suspended and fallen trees blocked some streets in Duesseldorf, where trams and underground trains were also stopped due to damaged overhead lines. Some locals reported electrical outages. 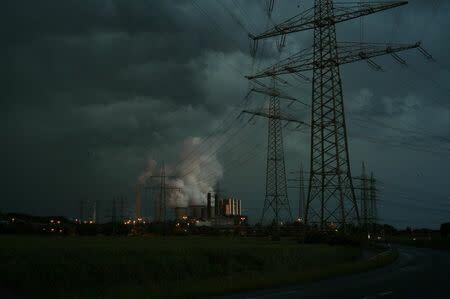 The storm front moved further northeast and the German Meteorological Service issued weather warnings for regions including Hanover and Bremen for the night.